I don’t know about you, but I wanted to try and get my tomatoes off to as good a start as I could. I’ve gone for several types, ‘Russian Rose’, ‘Spears Tennessee Green’, ‘Ildi’, ‘Crimson Crush’, ‘The Amateur’ to name but a few. I started them off from seed in the heated propagator in the spare room back in January. As soon as they broke the soil, they went on a sunny windowsill, so they didn’t become to leggy in the heat of the propagator. I only sow 3 seeds per pot (9cm) and then take out the weakest 2, leaving the strongest to grow happily. Once the plant is about 4/5 inches tall, i move them on to a bigger pot. I don’t know about you, but I always add perlite to my potting up mix. I find it stops the soil staying too wet, and it lets air into the roots more. My mix for the tomatoes was 1 scoop John Innes No2 compost, 2 scoops coir (which is a great substitute for peat moss, its made from coconut husks), 1 scoop perlite, a sprinkling of chicken manure pellets and a teaspoon of mycorrhizal fungi (which improves root development). I don’t have a heated greenhouse, just a regular cold one, but I’ve decided to put the tomatoes out as the weather hasn’t been too cold up here in Sheffield, its only about 5 degrees a t night. The tomatoes don’t seem to have suffered, in fact, the ‘Russian Rose’ has already put a couple flowers on. I had to pollinate them with a small paint brush, as I’ve only seen a few bees in the greenhouse and didn’t want to risk loosing the fruit due to it not been pollinated. 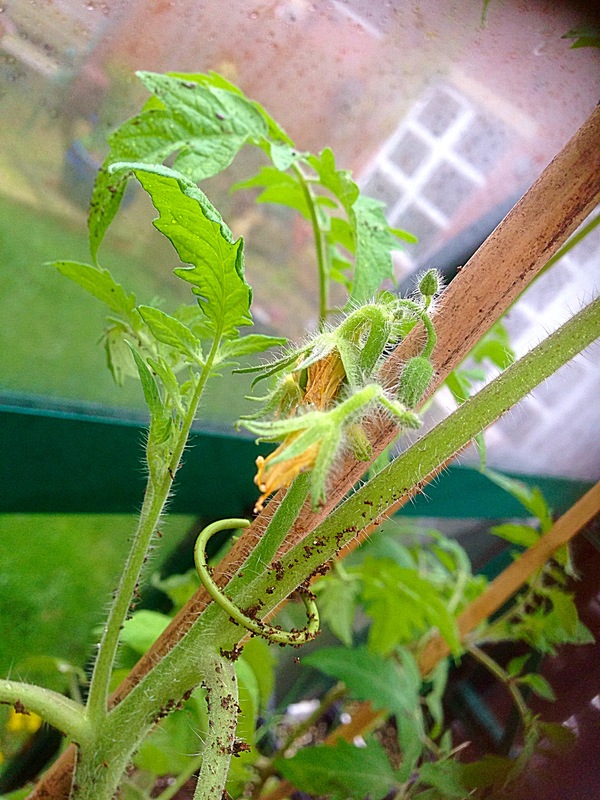 TIP – As you can see from the photo with the tomato flower, there is a pretty decent side shoot coming from the stem. ‘Russian Rose’ needs the side shoots taking off, so that it performs well. Normally, people take them off and add them to the compost bin. 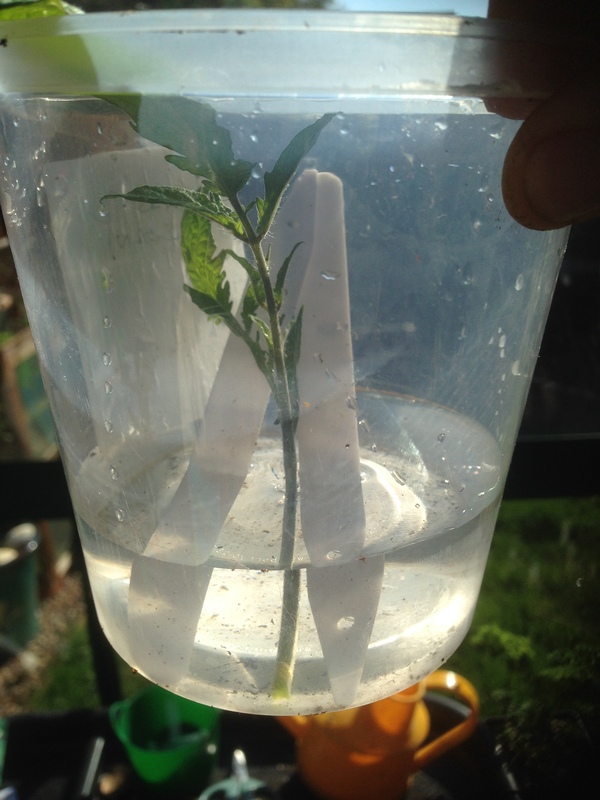 However, if you have a container of water ready, you can stick it in there and in a week or two, the shoot will have rooted. Wait until there are some good roots on it, them pot it up as you would a small tomato plant. This gives you a really healthy, sturdy plant for free. If you’re savvy enough, you can sow less seeds next year, as every side shoot will form a plant, so you won’t need to have hundreds of seedling on the window sill. It’s a quick trick that can really boost your supply of plants, even if you just want to give them to friends rather than compost them. When it comes to potatoes, I’ve decided to grow earlies second earlies and main crop. I love spuds, and so do my family, in fact with a small nephew and niece, you can’t have enough. My earlies are “Pentland Javelin’, they’ve been chitting on the windowsill in the spare room for about 2 months. Ideally they should have been in the ground from the end of February to the end of march, but because my allotment is so prone to water logging, I left them until easter weekend. I dug trench, added a layer of manure and then covered the spuds with 4-6 inches of soil. As they sprout, I’ll be earthing them up. 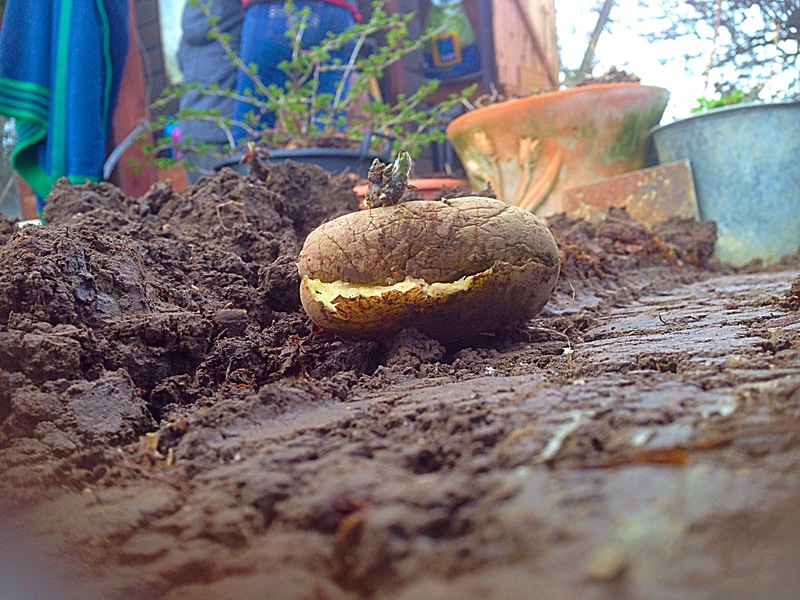 TIP – I half crush a potato thats spare and leave it on the top of the potato bed, or just lightly cover it with soil. I find that this attracts the slugs to it (as they can small it better), so you can keep checking the ‘slug spud’ and disposing of your unwanted visitors, without them boring holes into your crop. 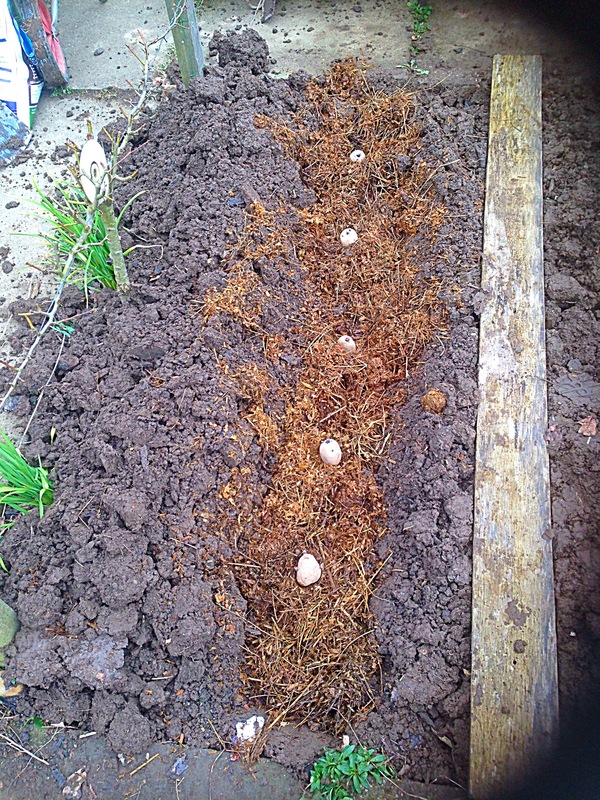 Earthing up – This is when you cover the growing tip of the potatoes with soil, it protects the plant from late frost, but also helps create more potatoes. It also stops the potatoes going green, as these are then inedible. Onions are probably my favourite veg. You don’t go a day without eating one. They’re in curry, pasta, soups, salads, sauces, in fact they are in almost every main meal I eat. That’s why I love them. However, onions are cheap, you can buy a bag of bog standard brown onions for about 50p. Thats why i don’t think there is much point in growing them, they aren’t cost effective. However, there are lots of onions that aren’t in the supermarket, or the green grocer, there are some amazing flavours and varieties out there, so give them a go. ‘Walla Walla’ onions are amazingly sweet, and they don’t have the harsh heat of a normal onion, in fact they are reported to be almost as sweet as an apple! 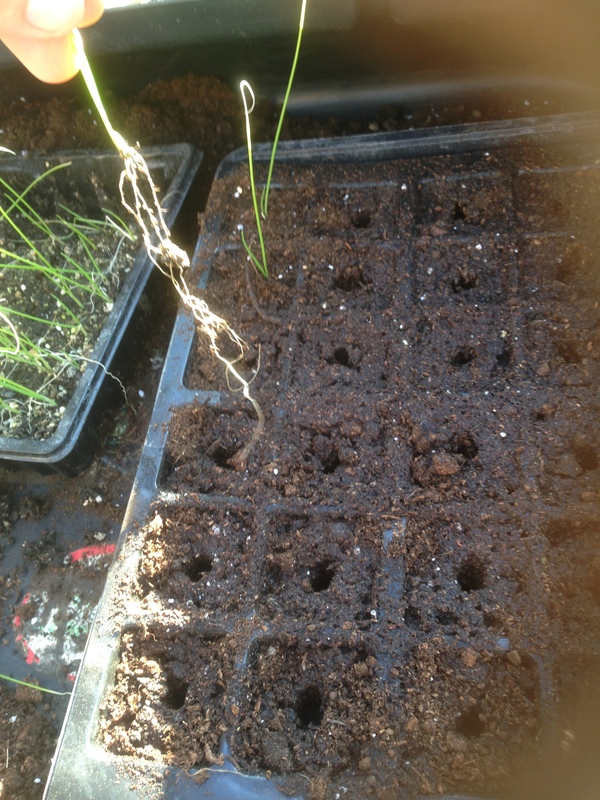 I’ve potted on my walla walla onion seedlings into modules to give them a better head start when they go into the ground. 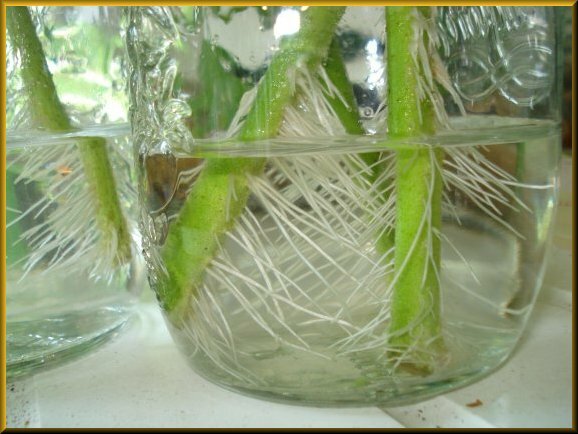 You can see that the little seedlings really do have great roots on them already. I’ll plant them out in May some time, when the ground is warm and the chance of frosts are just about over. DID YOU KNOW – Onions grown from seed are reported to keep for longer during the winter, compared to those grown from sets (tiny immature onion bulbs). I’ve only grown corn a few times. My plot used to suffer from rats a lot, and they would climb the plants to nibble on the corn cobs, resulting in nasty looking cobs, covered in rat spit! Not something I wanted to eat, so I gave them a miss. However, the council have now started to reduce the numbers of rats on our plots, so I thought I’d give corn a go again. I’ve gone for glass gem corn this year. Its a truly wonderful variety saved by native indians in America. It has kernels in almost every colour of the rainbow. 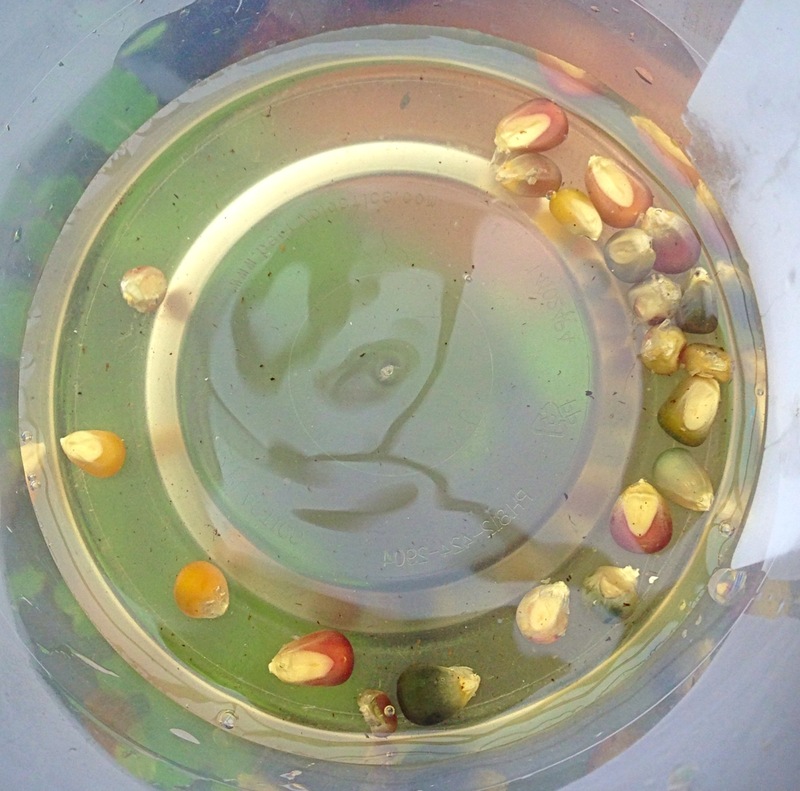 I started off by soaking my corn kernels in a camomile and aspirin solution (half a 300mg aspirin and a camomile tea bag in a litre of boiling water, left to cool), I left them over night. According to James Wong, aspirin has been proven to improve the corns cold tolerance as the plant grows, and as I’m in sheffield, this should really help me. Camomile is a natural anti fungal, so this should mean the plants get off to a problem free start too. Glass gem corn, isn’t really an eater. Its too hard to eat on the cob, but it can be used as pop corn. The only down side is, it looses the multi-coloured appearance and just looks like any other corn. The reason I’m growing it, is for decorative purposes. Can you imagine how cool this will look around halloween tied in bunches, or used in floral arrangements. It will be such a great talking point, and I find when people talk about something, they might want to give it a go. I’m all for getting people growing, no matter what they grow, or what they use it for! 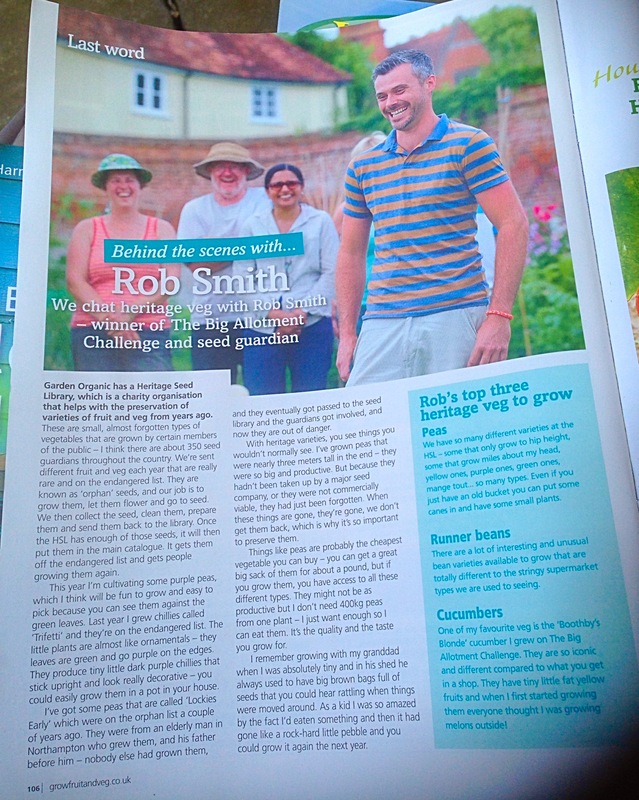 If you want to have a gardening themed read over the next few days, you’ll find an article in the grow fruit and veg magazine, all about what I like to grow, including Heritage Veg. 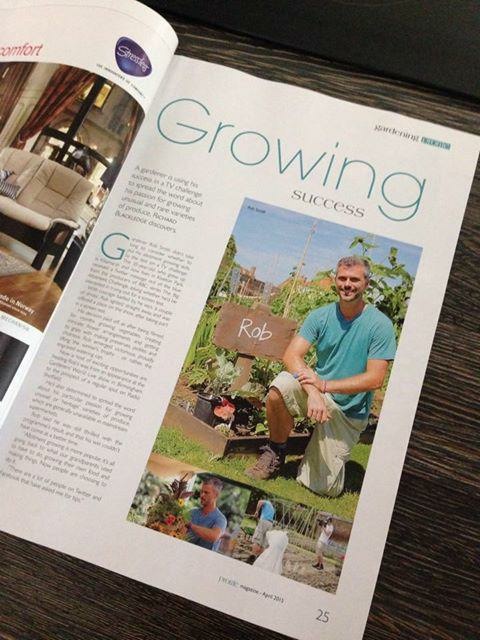 Sheffield’s glossy mag, ‘Profile’, also has a 3 page spread on life after BBC2’s Big Allotment Challenge. Have a good read, and please share any tips or post any comments on here. Excellent read – very helpful tips – I am new to growing veg so any information is always welcome. Next weekend I am having a new greenhouse put up – looking forward to grow tomatoes.